Rachel Evered’s socks for the Blanchet House. One young Holy Family Church member knocked the socks off leaders at the Blanchet House when she presented the donations from her community-service project. 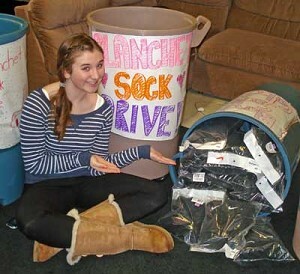 Graduating eighth-grader Rachel Evered gathered more than 500 pairs of new and gently used socks for the people in need served by the Blanchet House. Rachel had previously served as a volunteer at Blanchet, and her experiences were so moving and positive, that she dedicated her Independent Learning Project (a culminating service-learning experience for Holy Family students) to the agency. Blanchet offers food, clothing, shelter and aid to people in need. Two of Blanchet’s founders, Dan Harrington and Gene Feltz, are also Holy Family parishioners. Through her efforts, the girl said she learned a few valuable lessons: Hardships exist even in beautiful places like Portland; to be grateful for what she has been granted; and to share one’s time is the most valuable gift one can give. “Being involved in a life-changing organization, like Blanchet, is a blessing as well as a great opportunity,” Rachel said.